Exhibition of textiles and embroidery from The Sreepur Village, Bangladesh and also from the rural areas. All this beautiful work is created in adverse poverty by amazing women. There will be hand made cards, silk scarves and other gifts for sale. All proceeds will go to the 600 children and 150 destitute mothers who live at Sreepur, plus the Street Children project we run on the railway, the river banks and at Dhaka airport. Millions of street children live literally on the streets in Bangladesh. The 2015 Sreepur Quilt draw raised £640.00 Amazing! People are so kind. 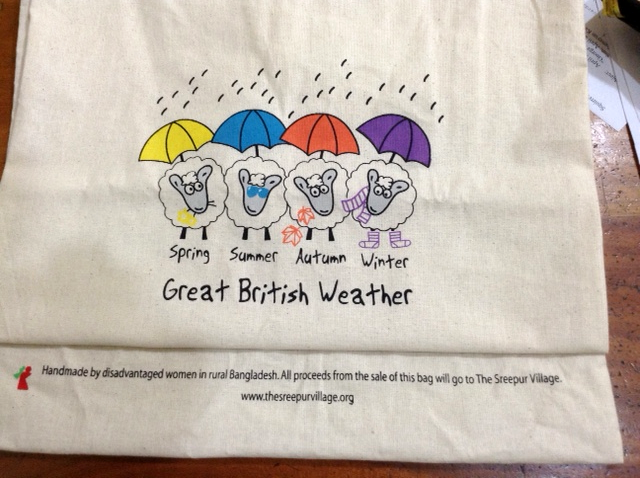 Sreepur cotton bags are being sold at all Mountain Warehouse shops in the UK. Ruby bought in the one at Cheshire Oaks today and says “I am delighted!” We have had another order from Mountain Warehouse for ten thousand more bags, so pleased! 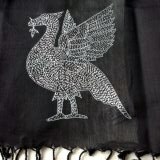 Ruby’s best selling item this year are the Liverpool scarves with the hand embroidered Liverbird. She has sold over £2000 on the Liverpool scarves and is still selling them. The recent “Threading Dreams” exhibition in Liverpool Town Hall went so well. We raised £2525.00. Amazing! People are so kind, thank you to our members and so many of the NW Branches who visited the exhibition. 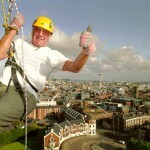 Some stayed in the city overnight and enjoyed Liverpool and all it has to offer. Wonderful! Ruby brought some of the beautifully embroidered silk squares from the latest Sreepur quilt, which this year has a butterfly theme, to MEG September meeting. 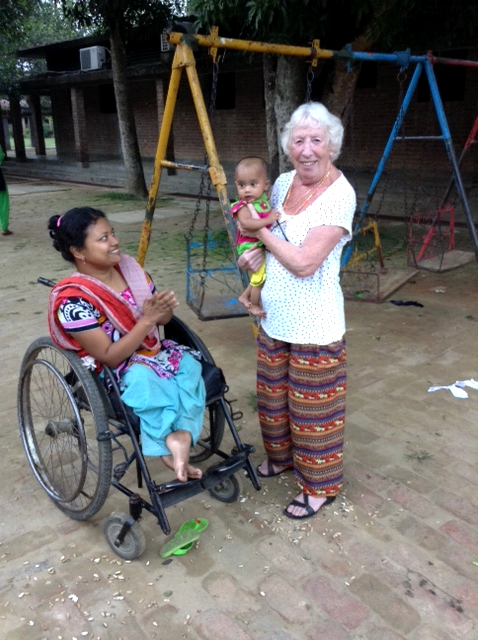 Ruby has sent us some more photos from her recent visit to Bangladesh. Further updates soon. There was a real treat for all at Sreepur – they had ice cream! The ice cream man cycled 8 miles from Mona Bazar to Sreepur. Some of the roads are only dirt tracks. A close friend of Ken and Ruby paid for them – how kind! Some had never had ice cream before. One little girl asked if Ruby had brought them from England! Ken and I went to visit Mandy at News From Nowhere, 96 Bold Street, Liverpool, Merseyside L1 4HY. Mandy has been selling Sreepur cards for a number of years and we are always made welcome with a new supply. Happy Birthday cards sell well. Once again Ken and I were invited to the Widnes Rotary Dinner to commemorate Paul Harris the founder of the Rotary. A few years ago I was made a Paul Harris Fellow, so I was delighted to wear my medal for the evening. Lots of lovely people – honoured to have been invited. They are going to hold another fundraising event in April for Sreepur. On 21st January 2015 I went to talk to the Frodsham Quilters. The room was full of very experienced needle women, some I have known for many years. I took lots of traditional Kantha Quilts, saris with hand embroidery and natural dyes, also other embroidery to show them. Almost filled the room with all the bright colours of textiles from Bangladesh. It is about 8 years since my last visit so I had lots of information to pass on about the wonderful work at Sreepur and the new drop in centres we have opened in and around Dhaka in the last few years. A lovely afternoon and we raised £300.00 How kind. Kathy and I went to The Civic Mass at the Liverpool Metropolitan Cathedral. This is a wonderful annual event attended by the Lord Mayor, Lady Mayoress, Mayors from the Boroughs, Councillors, MP’s, Judges and Magistrates. A spectacular event! We all went to the reception which was excellent, and talked to lots of interesting people about Sreepur. We went Dovedale Baptist Church and had a cosy afternoon with lovely people. I have been a speaker for this group for many years. They enjoyed my stories from Sreepur and bought some cards, scarves and other gifts. The new glasses strings sold well. Janette and I designed them in November – very colourful and useful. International Women’s Day, Fair Trade Fortnight, International Women’s Day of Prayer – I do get invited to lots of events during this time. I am always pleased to accept. We started at Liverpool Anglican Cathedral for our annual “Threading Dreams” Exhibition, which always looks so beautiful in this magnificent Cathedral. We spoke to visitors from all over the world, also visitors from all over the UK- many staying at the Adelphi Hotel, Ranelagh Street, Liverpool, L3 5UL and enjoying Liverpool. The Liverpool cotton bags sold well. The staff and volunteers are so helpful and always support Sreepur by buying gifts for their families. The following week the exhibition went to St Barnabus Church, Penny Lane, Liverpool. The members of this church work so hard to make everybody welcome – making tea and coffee for our visitors, and showing them around this beautiful church. On the first day Ken, Kathy and I put up the exhibition and then left Kathy as we had to go up the motorway to Leeds as I was the guest speaker at an International Rally organised by the Yorkshire Inner Wheel. The Rim was full with about 150 members who had travelled from all over Yorkshire on a very cold wet morning. It was an excellent event – honoured and privileged to have been invited. 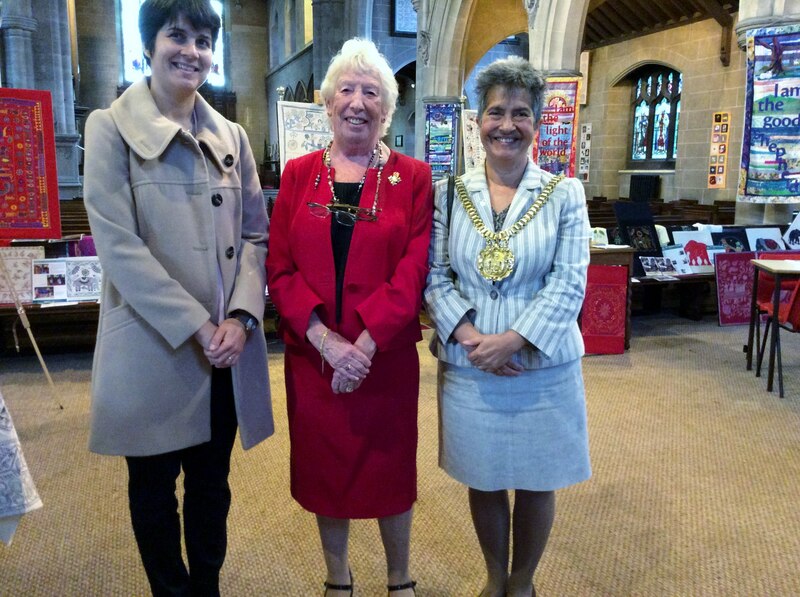 The “Threading Dreams” Exhibition continued all week in St Barnabus Church. On Saturday the last day Allerton in Bloom had an afternoon tea raising money to buy flowers to be placed around the local area. They joined us – a wonderful event. Janette and our grandchildren bought lots of plants for our gardens we sold lots of Sreepur stock that day. 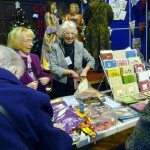 Kathy and my cousin Marie had a stall at St Mary’s Church, Cressington a few miles away. It was their Spring Fair and they always invite us to join them at their events. On 19th March 2015 I spent a wonderful afternoon at the Unitarian Church, Ullet Road Liverpool, L17 2AA, a church I know so well, on a main road going into the city and also our branch of the Embroiderers’ Guild have used this church for many events since I became a member over 30 years ago. It is beautiful. My Talk was to the British League of Unitarian and other Liberal Christian Women from Merseyside and Wirral. They were most interesting members. We were in the small library. Of all the rooms I have ever spoken in this was one of the most inspiring, with all the dark oak furnishing and the most beautiful oil painted frescos on the ceiling. The church is renowned for the Burne Jones windows. As I said March is always busy we raised over £2000.00 during these events. People are so kind. This money will go a long way at Sreepur, Bangladesh. My daughter Janette worked with Sreepur Village Trade to design this new range of products on our last visit to Sreepur in October last year. The small phone bags as shown are £3 and the larger wash bags seen here with Parul are £5. 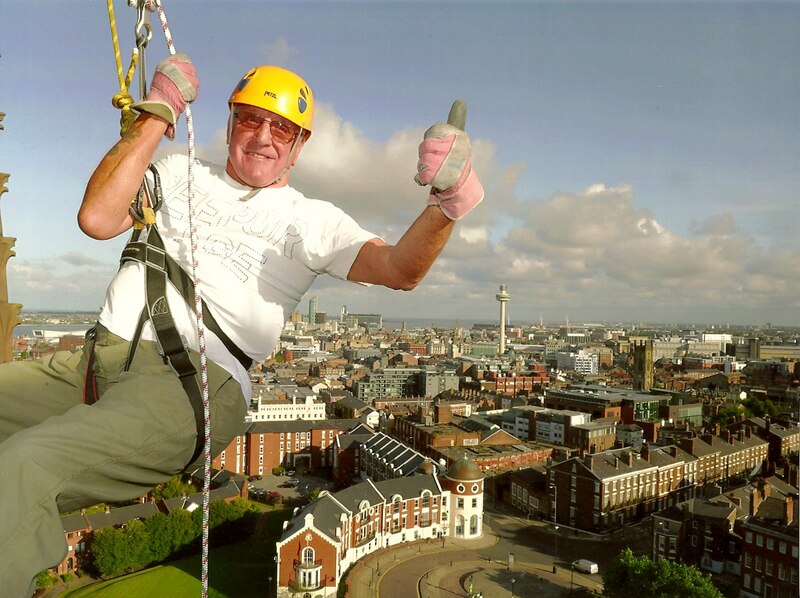 August 2014 Ken and Mathew’s Cathedral abseil raised £11200.00 for Sreepur. Thank you to all who sponsored them and supported them on the day – how kind! 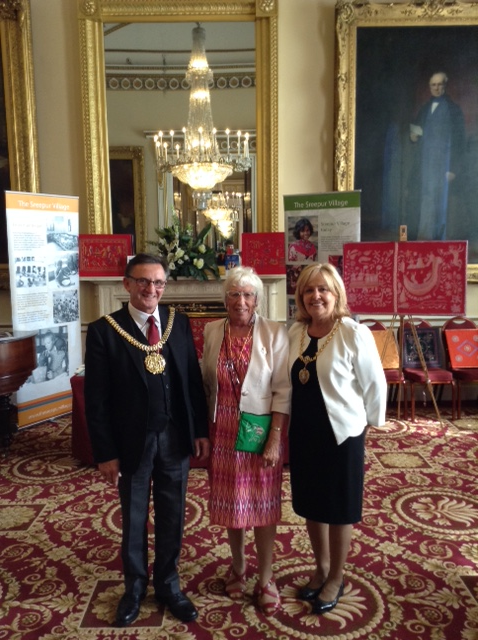 “Threading Dreams” Exhibition was welcomed back to Liverpool Town Hall. We had lots of visitors from all over the world, all interested in the beautiful embroidery from Bangladesh and buying gifts to take home. 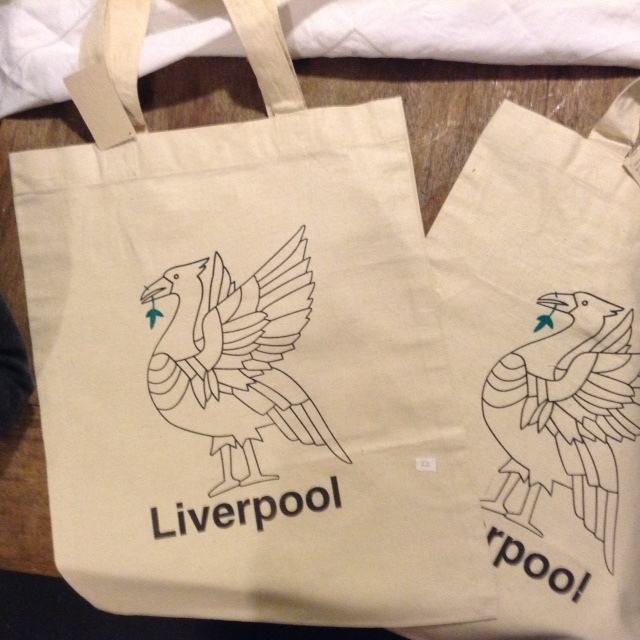 The Liverpool Cotton bags always sell well at this event. We raised over £1000.00. The Lord Mayor and Lady Mayoress visited often. September 2014 I was not at our MEG branch Tea Party as Ken and I were celebrating our Golden Wedding- 50 years amazing! Kathy, my sister, had the Sreepur stall and raised £160.00 from our wonderful members. I had a lovely evening with the Cranford Quilters – a lovely group. 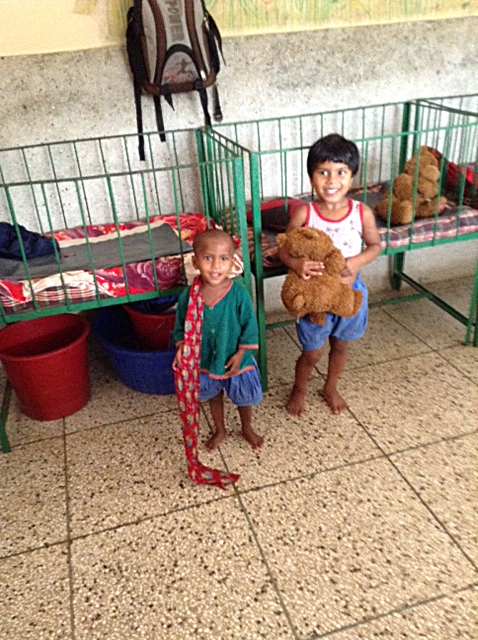 They enjoyed seeing all my silk wall hangings made by our EG branch members and the mothers at Sreepur. 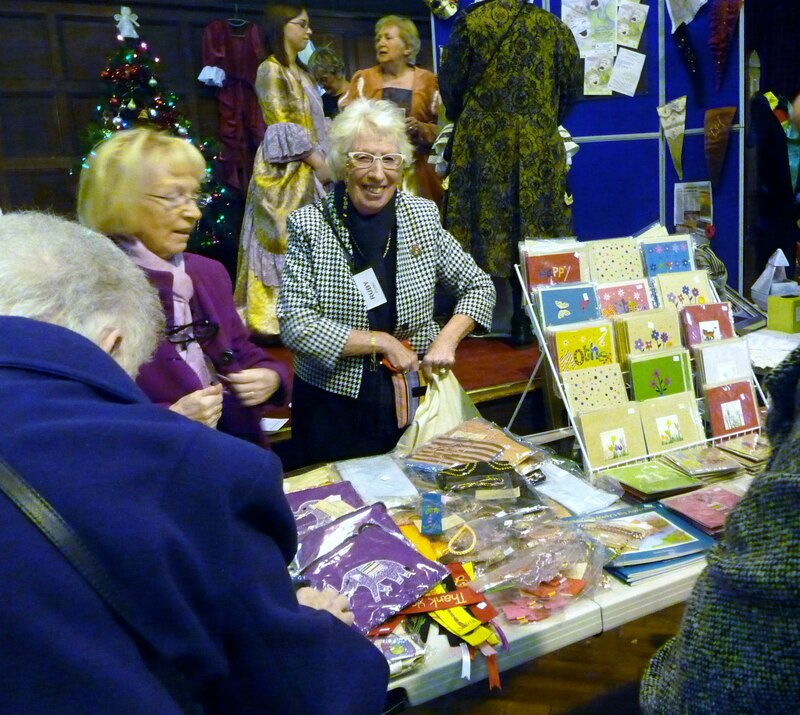 The Cranford Quilters also had beautiful work on display, and they bought scarves and cards, over £200.00. Excellent! Next day a trip up the M 6 close to Kendal to talk to The Letherins Quilters. I had not met them before but they made Ken and I so welcome. Once again they had beautiful quilts on display. They enjoyed my stories and seeing the Kantha Quilts I brought to show them. I raised over £600.00 for the children and mothers at Sreepur. How kind! Ken and I stayed overnight in the local old pub- the lady the next morning said it was haunted!!!! On Thursday I was invited to The Liverpool Ramblers I have talked to them often over the years. Always interested in my update with news of Sreepur. The warm wool and jute scarves sold well- good for walking on a cold day. £160.00 raised. It was a delight to be back at The Coach House gallery in Calderstones Park. The Readers Group now run the Gallery. I met old friends, dog walkers, mums with their babies in prams. What a lovely week and the Kanthas looked lovely. £1250.00 – how kind! October now and Sreepur gifts for Christmas are selling well. The members of St Georges RC Church in Maghull are a very lively group of lovely ladies so interested in my work at Sreepur, They asked lots of questions and enjoyed my images of the children. So interested in the Street children in Dhaka. sold £140.00, but weeks later I received a cheque for £865.00. They had a coffee morning for Sreepur. Amazing! This will go a long way in Bangladesh. I do meet such wonderful kind people. Over on the Wirral for a talk in Morton. 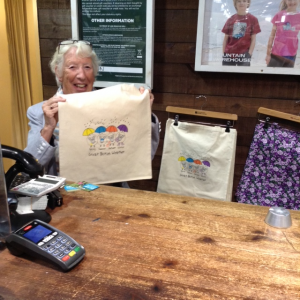 made so welcome and the Christmas cards sold well, and the Happy Christmas cotton bags. Raised £250.00 – lovely people! The Anglican Cathedral Mothers Union invited me to talk to them. It was lovely to tell my stories to people I meet so often with my exhibition at The Cathedral, and to explain in detail all about Sreepur. £150.00 raised. Saturday 11 October 2014 back in St Barnabus for their Autumn Fayre. Back with old friends buying the scarves and other gifts for Christmas. The “Threading Dreams” exhibition at St Barnabus looked so lovely in this beautiful old church. It was good to be back. The members of this church are so supportive of my work at Sreepur. 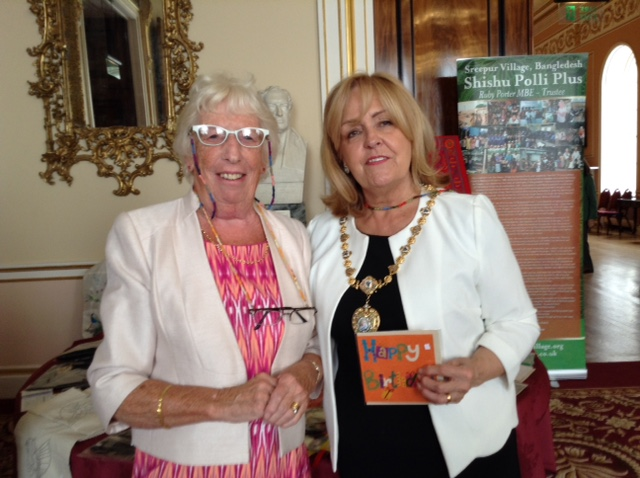 The Lord Mayor and Lady Mayoress visited our exhibition and had tea with our visitors. We raised over £600.00 this week. I went to a Trustees meeting in London then had a flight to Bangladesh on the Monday. Excellent visit with our daughter Janette. No time for jet lag – back on the road with Ken as chauffeur and bag carrier, technician etc. to Sale, Manchester for the next talk at the Montague Patches. Such an interesting group. 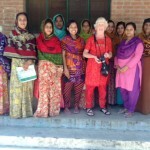 They made me so welcome and loved all the Bangladesh textiles I brought to show them. They loved the silk scarves and did their Christmas shopping. £600.00 – excellent evening. 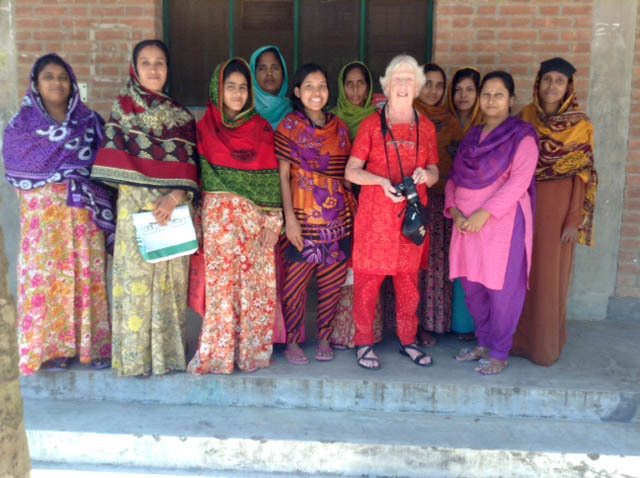 Ruby Porter MBE had a meeting with the mothers who embroider in Sreepur, Bangladesh 2014. They are happy with their work. I am invited each year to the Unitarian Church, Ullet Road for their Christmas Fair. The hall looked very festive and lots of visitors. £170.00 sold. Knowlsley Church hall – a very cold evening, but a warm welcome from the members. 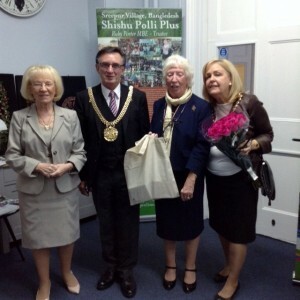 One lady had been to the Town Hall exhibition and invited me to tell them all about Sreepur. Sold £140.00. So kind! Holy Trinity church, Wavertree. Once again I have been invited to talk to them. They were interested in all my news from my last visit to Sreepur. Nice to meet old friends, £130 sold from Sreepur gifts. Back up the M62 to Burnley to speak at a Lunch. Lovely people in a lovely small village. They enjoyed learning about Sreepur. One lady had been in hospital and not been able to do Christmas shopping so she was delighted to buy most of her gifts from Sreepur. She was almost in tears and so grateful for my visit. £350.00 sold that afternoon. Next day back at the HSE office in Bootle for a lunch time sale. For 4 years now I have been invited. They are all so kind and look forward to my visit over £300.00 sold in 2 hours. A busy week. 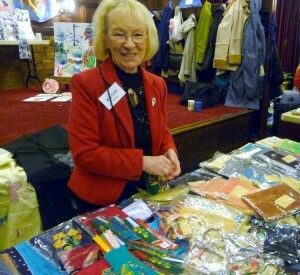 Janette organised a Fair Trade evening at SARA Hall in Aigburth. We had a stall and exhibition for Sreepur, and also a stall with gifts from Nepal, and the young people from the church club selling tea and cakes for their Lourdes fund. Finny and Reuben, our grandchildren. among them. 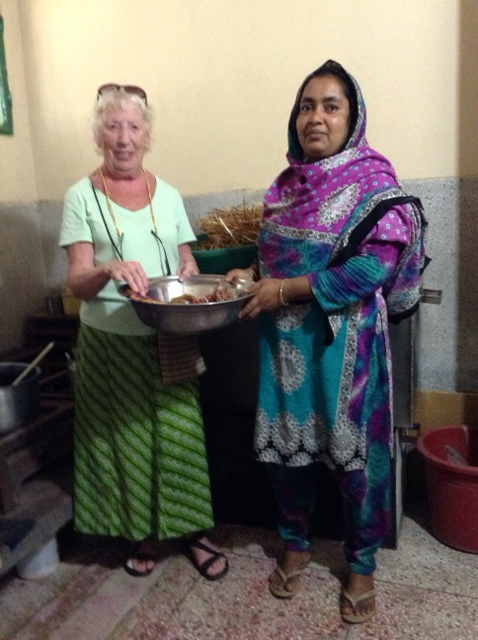 Sreepur raised £500.00 and we have been invited back in 2015. Monday 1st December 2014 Ken and I went to St Michael in The Hamlet church, known as the Cast Iron Church. It is beautiful, 200 years old in 2015. Met wonderful people and sold the scarves and cards etc. over £100.00. Our MEG Christmas Party is always an excellent afternoon with lots of member, old and new. Some I have been friends with for over 30 years. Good food, good company still Christmas shopping from Sreepur. Over £200 raised. We do have lovely members – all so kind. I had a very interesting visit to the Methodist church hall in Wavertree to an event called “Women Meet Women”. Lovely Asian women who get together to learn about health and wellbeing. I was delighted to have been invited as guest of honour. I hope to get more involved as most of them were from Bangladesh. 15 December 2014. Liverpool Town Hall had a wonderful Christmas event all day. The Town Hall looked magnificent with all the decorations adding to the splendour of this amazing building. We raised over £100.00. 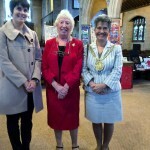 My last event was at St Austin’s Church for the Christmas Carol Service. We sold Sreepur gifts in the hall after and sold £100.00. 2014 was as other years a very successful year for fundraising. All the money will go to Sreepur for the 600 children and 150 mothers who live there with us, also the street children who need our help. Thank you all so much. I could not do all I do without the help of Ken, my family, my sister Kathy and cousin Marie, and all of you.